For the last couple of years, since I really started dabbling in mixed-media art, I have wanted my own studio. In my dreams it is a little cottage behind my house. It is just for me. It has window boxes filled with pretty flowers on the side that faces the house. The back of my studio cottage is fenced in so I can watch my miniature donkeys, miniature horses and goats frolicking in the back yard. My cottage has a nice little powder room so I wouldn’t have to run back and forth to the real house after my 15 cups of morning coffee. There would also be a kitchenette so I wouldn’t have to run back and forth to the real house for my 15 morning snacks! Ahhhhh, but this is not to be. Not yet anyway. Right now I have to be content with this…. 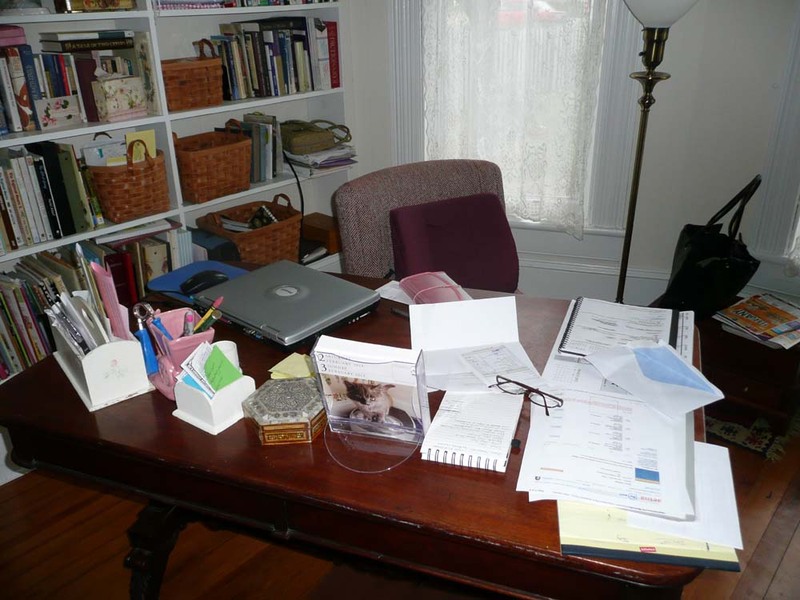 This horrible train wreck of a space is our parlor which serves as my studio/office. I am baring it all, the good, the bad and the ugly. 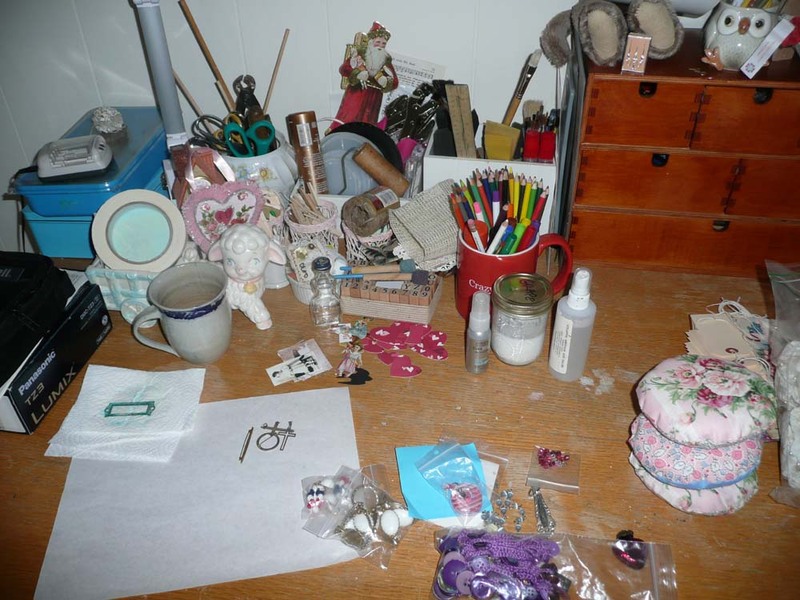 Here is my art table. Let’s take a closer look….WARNING….graphic picture ahead! These horrors are adjacent to my art table. 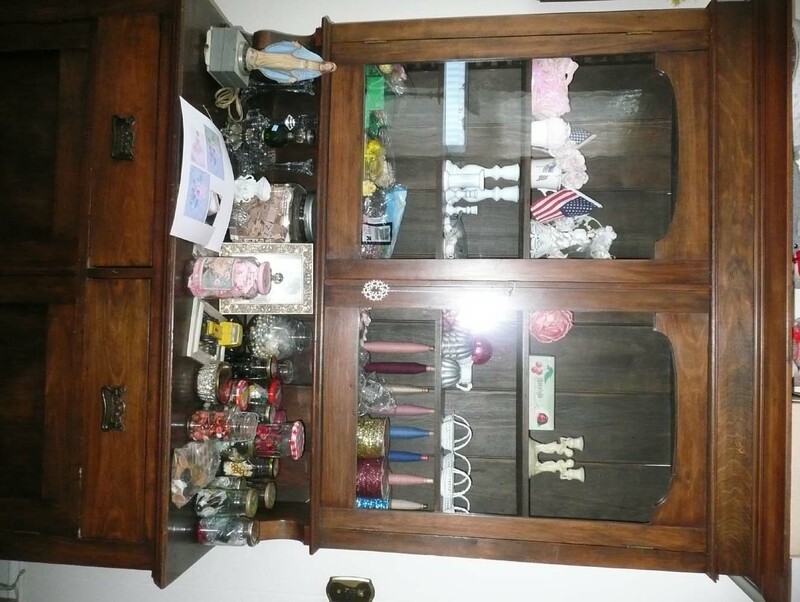 There are books, buttons, a sewing box, boxes of feathers, trims, ribbons and my collection of cardboard. (Only other mixed-media freaks understand why I have a collection of cardboard) Behind the lace curtain is a cool old piece of furniture from and old hardware store. It has a zillion cubbies. Unfortunately they are so filled with odds-and- ends I get a migraine just looking at it! My step-back cupboard dates from the 1920’s. There is so much junk on it, it looks like I’ve been collecting since the 1920’s. Let’s see, there’s jars of buttons, spools of thread, a giant jar of scrabble tiles, unfinished projects and a light-up statue of Mary that is also a music box and rosary holder. Don’t ask. This disgrace is my desk. Is it any wonder I can never find the papers I’m looking for? There could actually be lost chocolates under there! That’s reason enough to clean up. This built in bookshelf is next to my desk. 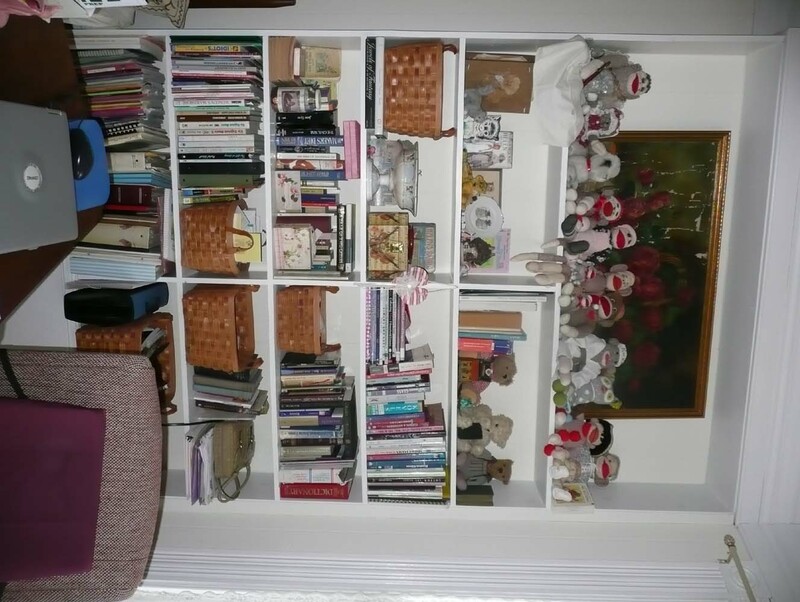 Check out my sock monkey collection on the top shelf. Sweet, right? 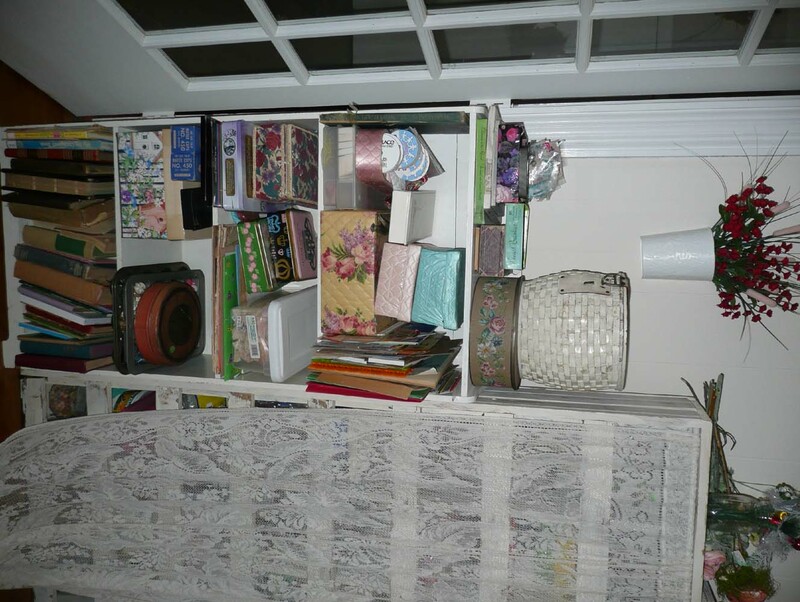 There are more on top of the step-back cupboard, you just can’t see them in the picture. I know what you’re thinking, sock monkeys, really? Yes, really! But alas, these shelves need work too. So now that you’ve seen the ugly, I’ll show you the one good spot. 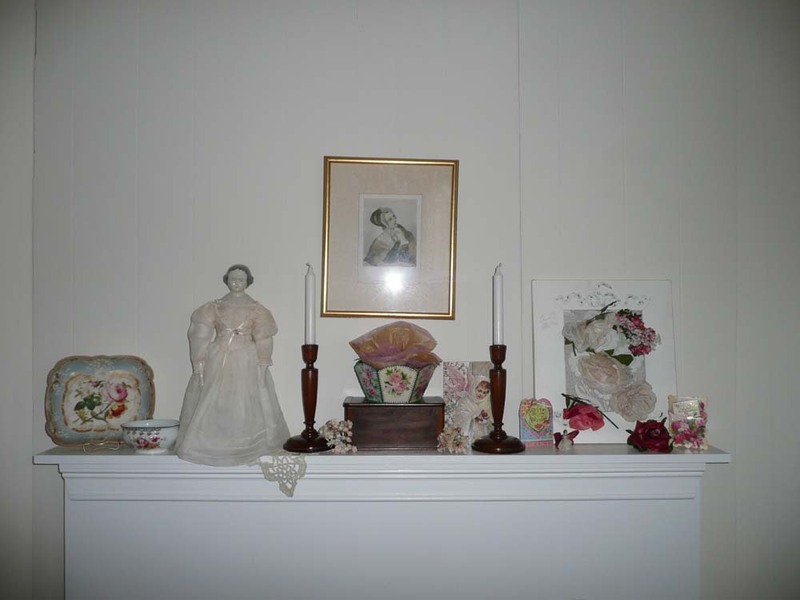 This is the mantle over my gas fireplace. It has lots of pretties on it and it’s all dressed up for Valentine’s Day. So basically one 6ft. shelf in an entire 15 x 16 foot room is not in a state-of-emergency. I am therefore, right now, publicly letting you all know that in the next two weeks, (God willing and the creek don’t rise), I am going to make over this train wreck of a room. Not only will it be a pretty place for me to work, it will also be functional. So from then on anything stuck to a collage, like a toothpick or the cat, will be intentional and deep!!!! 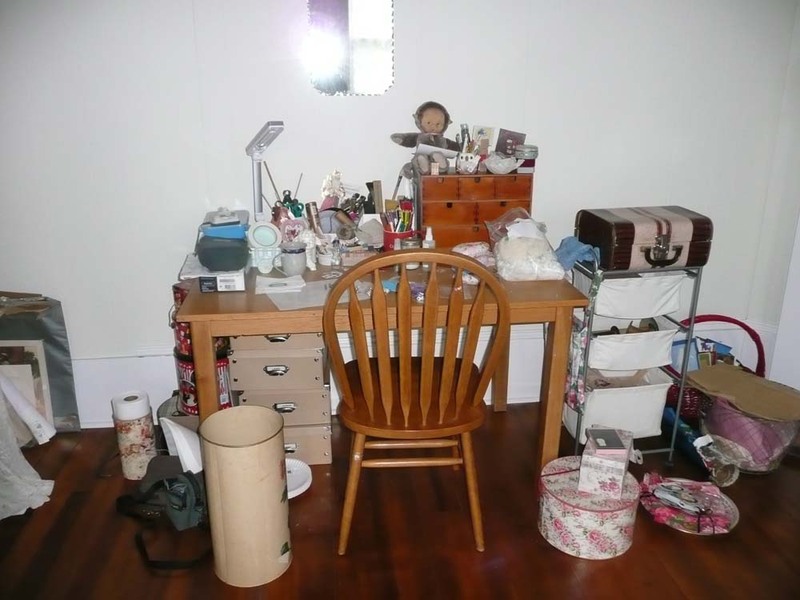 Love your train wreck and can’t wait to see how you organize your space. You should see my space right now; I’m in the middle of making Valentines. Talk about a train wreck!